Training Quinn is easy and fun. But only when my body says it is okay to do training. And most days, it doesn’t even want to get out of bed. So what to do on those days? We work on manners (sit, back up, wait) because we do NOT want her to knock me down even on a good day! We do this at doorways, while I am at a counter making lunch, or just when I go to the bathroom. Quinn follows me everywhere. We work on retrievals. Makes sense since I can’t bend down to pick stuff up on bad days! I also am making an effort to name everything now. “Get it” becomes “get my towel” (I keep on on my armrest for support) or “get the keys”. We go outside. Now that spring is almost kinda sorta here, there are days when I can go outside with them and sit on the Dog Deck. Watching Quinn outside is a treat. And exhausting since she is so enthusiastic about everything she does. When we are outside, I will call her to me just to reinforce it. So there’s things one can do on bad days. Even if just small things, the dog will love the interaction and your spirits will most likely lift a little. Quinn may be a nut. She may be rather hyperactive-slash-enthusiastic. But she has a brain and is learning how to use it. Which is frightening and joyous at the same time. For example, she figures stuff out on her own. Training her isn’t just about tasks, but keeping that brain active and allowing her to figure out the puzzles. Like, I accidentally dropped something. Asked her to pick it up. I couldn’t bend forward so I kept my hand on my knee, palm up, and asked her to give it to me. Because my chair was partially reclined, she couldn’t just simply put it in my hand. She had to step up onto the footrests and put it in my hand. Not my lap, my hand. And it took her just a few seconds to figure it out. I watched the wheels turn and heard the rocks grind in her noggin. And it was like any other kind of “shaping” a behavior except she did it herself. She knew she had to put her feet on the footrests in order to reach me. We do this a lot. She knew she had to put the item in my hand, something we always do. She combined the two and bingo! it was in my hand. Now, keep in mind this is Quinn. The Mistress of Duh. The dog that runs and hits her head but keeps on going. We did the same thing to teach her, in one or two tries, how to walk by my side. She doesn’t STAY there yet, but we’re getting there. How? She knows “touch it”. She knows me patting my thigh means “come here”. So I pat my thigh and put my hand down, palm back. She comes back, turns around, and touches her nose to the palm. Alas, she is almost immediately off again, but that distance is closing. She’s not going as far. Quinn is also off leash now! I wouldn’t trust her just anywhere yet, but she’s getting better. How? She knows “get in the van” so runs right to it. Well, yeah, she wanders along the way, mostly because I take so long to get there. And once, just once, she saw a squirrel run from the ramp and up the tree so each time she has to go check out the tree. So to get from van to house, I said “let’s go to the house”. With her on leash, we walked directly to the front door with me saying the cue about twice more. Then I started dropping the leash and she’d drag it behind her as she went to the front door. (but she often would stop, pick it up, and hand it back. Bless her heart) Finally I stopped using the safety of the leash and just said the cue. She doesn’t go straight to the door. She does wander a bit. But not out of sight. And by the time I get to the door, she is, too. Next week I’ll brainstorm about what other tasks or training she needs and we’ll work out a plan! Okay? Okay! Wow. I’ve fallen in my duties of announcing Quinn’s awesomeness! How dare I!? Right? Quinn is 2.5 yrs old. Can’t believe I let her live this long. Just kidding. Kinda. Puppyhood with Quinn was a trial. She was a sweetheart until we tried to make her do something she didn’t want to do. We worked with a trainer to learn how to handle it and the behavior slowly went away. She’s still stubborn, though! And I’m fine with that. Quinn is now officially a Service Dog! She’s doing tasks that assist me as a person with disabilities. She doesn’t do her business in public. She could be better with where she puts her nose but that’s improving. We’ve not done a grocery store although she’s gone into several restaurants. Quinn is so enthusiastic about everything she does. On the one hand, I don’t want to diminish that curiosity. On the other hand, I don’t want her to be obnoxious. I want her to listen to ME, not her nose. Quinn knows a lot of tasks. She can retrieve several items by name (leash, stick/crutch) and we’re working on others (shoe, Lorna). She can do these things with either hand gestures or vocal cues. She loves loves taking off my socks. I am going to make an effort to post here at least once a week. I am trying to get out of the time sucking, brain draining, blood pressure raising entity that is Facebook. Quinn has a page there and of course I do. So here’s hoping I keep up with my self-proclamation, eh? Author QuinnPosted on 04/11/2019 04/15/2019 Categories Real Life, Training1 Comment on Been a while, eh? Today was Errand Day, also known as Monday. Quinn went with us everywhere but did not go into any place we went. She did learn some table manners when we ate outside at Nick’s (a wonderful Greek kinda place with wonderful burgers). She’s been there before but this time, I had her do tasks while still being calm. I “accidentally” dropped my keys several times. She picked them up immediately and loved the chicken from my gyro. She remained in place (against my chair) for most of our time there. She did do some floor surfing (which, really, I’m not opposed to as a SD handler but some handlers believe it is wrong) and scootched around a lot. We worked on “wait” while the van doors were left open. She’s doing better with the back door being left open but the side door “wait until I say you can come out or not” needs some work. We even left her in the van, windows down, while we went inside the laundromat. I could see the van from where we were. She didn’t even stick her head out! Her harness I need to do some work on. It needs cleaning and the Velcro replaced. Since it is leather, I’ll have to find someone who can do it. It is plain brown so I’ll need to come up with ways to mark her as a Service Dog. Identification, capes, etc are not necessary according to the Americans With Disabilities Act (ADA) but nearly everyone has something. And speaking of the harness, I need to teach her “stand”. It is a body position quite useful for when gear is being put on or the harness adjusted, or whatever! Officially Service Dog in Training! So I’ve made my decision. An easy one but one I had to consider all the ducks and line them up. Quinn is now a Service Dog in Training (SDiT). What does that mean? In North Carolina (and many other states) a handler with an SDiT has the same access rights as one with a “real” SD. I can take Quinn wherever I go. Before, we’ve only gone to dog friendly places and one trip to Blue Mountain Pizza. It’s time for her to learn that the tasks she does at home, she is to do AWAY from home, too. In all situations and places. Time to add distractions (kids, other dogs, smells) and practice, practice, practice. With Joella, I used a red cape. It was easy to put on and take off and it was, like, RED. On her black coat, it really looked good. Not that anyone paid much attention to the “do not pet” patches but that’s another post. But what I don’t like about most SD gear is the part in the front goes straight across the shoulders vs dipping down into a Y to go down the chest and reconnect to the belly part. Those that go straight across tend to restrict shoulder movement, or, at the least, make the dog think it is restricted. This can lead to muscle and bone issues. It is the standard, however, and finding one for Quinn that I liked was getting difficult. Then a friend who knew someone who knew someone with a service dog had a leather harness they needed to rehome. The friend asked my friend if she knew anyone. Which means I have a cool leather harness for Quinn. I need to get some stuff to clean and protect it but it’s a nice harness. And it does not restrict shoulder movement at all. It is plain brown so I’ll need to add stuff to it to make it look “official”. By law, a service dog does not need to wear any identification at all. It’s just folks expect it and it makes it a LOT easier. Jo’s had a “Service Dog” patch and a “Working, Do Not Pet” patch. Quinn’s will be more subtle I think. I’ll do a velcro spot with patches to make it look “official”. 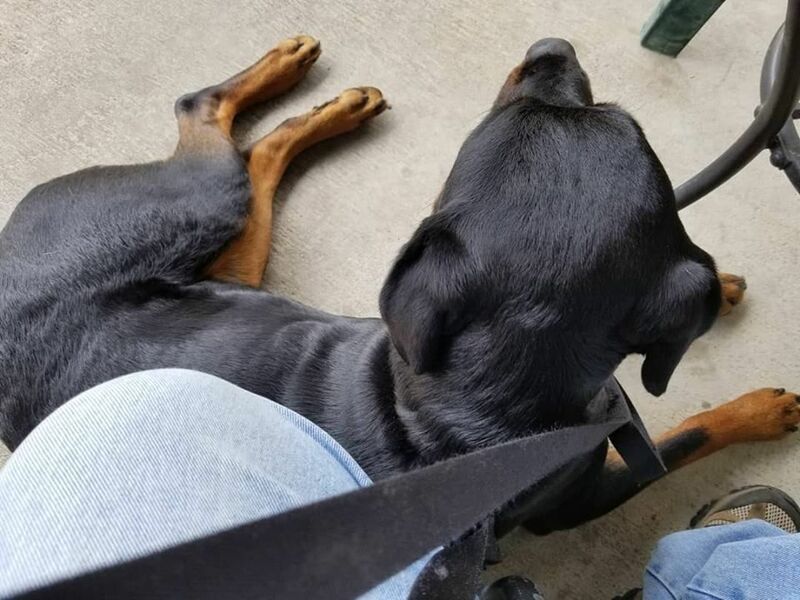 Author QuinnPosted on 05/05/2018 Categories TrainingTags Joella, Tasks1 Comment on Officially Service Dog in Training! Joella had a long list of tasks she could do. And it is hard to keep in mind that Quinn is not Joella and I cannot expect her to do the same. Plus, my needs for a service dog have changed and I understand those needs better. According to the Americans with Disabilities Act (ADA), a service animal can only be a dog (and some miniature ponies) and must do at least one trained task that assists the person with the disability. Carrying a backpack is not a trained task since it doesn’t take training for it (unless the dog hates it and you have to work with them but that’s not “training”, that acclimatizing). So simply having a dog carrying your books in a dog backpack is not a trained task even if it helps. Pushing a door button so it opens, yes. Picking up your bag, yes. Handing you something you dropped, yes. The wonderful thing about breaking down a task into bits is those bits can go into other tasks. TOUCH for example is the basics for a lot of tasks. You teach TOUCH in order for them to understand this is what we are working with. I want you to touch it (over and over). Once Quinn had the basics of TOUCH down, TAKE was easy(ish). So will be pull, push, open, and close. Each task can be broken down into bits. But more on training in another article. As we continue to learn together, I’ll add to the list on the tasks page (to be made but look for it the top or side menu). In terms of dog cues (commands, requests, whatever) take and get are a lot alike. And both are rather useless without the GIVE which is that thing you just took/got, please release it. Quinn is a very excited, energetic, full-on puppy. She is 8 mos now, probably around 65lbs (29.5ish kg). She’s smaller than her brother Ragnar who lives up in Pittsburgh. He is freakin’ huge at around 90lbs (40.8kg). But I’m not worried. Quinn is growing slowly which is good. Her bones and muscles are excellent. She is growing at her rate, Ragnar is growing at his. Harnessing this energy during training time is…difficult. We worked a long time on TOUCH just to get her bored with it, to keep her from biting everything. She didn’t get treated for mouthing, just touching with her nose. And now I wanted her to take something in her mouth. Yeah, okay. I have an old wooden backscratcher where the “hand” part of it had broken off. The end of it is quite large, perfect as an object to touch, while the rest of it was a thinner dowel. Quinn knew to touch different object already but this was WOOD! Wood was FOOD! Took us several minutes before she realized she got nothing for grabbing the end with her mouth. But if her nose touched it, she got a good YES and a lot of treats. Soon she was touching it no matter where I held it out. (ensuring the dog will move around to touch an object is a goal to keep in mind) We left it alone for a few days and returned to it. She mouthed it for just a few seconds then was back to touching it. Next day, we started with my hand, the Lollipop, and then the handle. I was asking for 3 touches per treat. Next I took blue painting tape (dogs can see blue) and wrapped it around the middle of the dowel. We worked on touching my hand, the Lollipop, the handle, and then I turned it sideways, grasping it on either side of the blue tape and held it out. I didn’t say anything. Now this was different. This was not something pointing at her, but was being held out. My hand is like that, but my hand has lots of surface area. She knew we were working on touch but she was really excited about this difference so when she went to touch it, she grabbed it with her open mouth just for a second. JACKPOT! YES! Treat treat treat. Quinn was confused and for good reason. I’d never allowed her to mouth something before. But now she could? She grabbed it again but harder. I told her to drop and offered it again. No treat. She did grabbed it with her mouth again but quickly. YES! Treat treat treat. We did this several times then stopped. I ended with her following my hand (which she loves to do) as we worked on having her place herself in front of me. She gets treats so she doesn’t care. Next day, we worked on it again. I built up to it as before, held it out, but again offered no cue word. She took it in her mouth and let go. Treat. Repeated numerous times. Once she was taking it as soon as I offered it, I started adding the cue “take”. I offered it as I said the word, I said the word then offered, etc. She took it in her mouth and got a treat. A few days later, I added the next step. I didn’t do it until she was calmer and as she took it in her mouth, I let go of it, keeping my hands underneath in case she let go. I then said DROP, which she did. So now I was offering the dowel, saying TAKE, she took, then I said DROP, and she did. Treat treat treat. Quinn will now take the dowel from one hand and drop it into my other hand. She will also pick it up off the floor should she miss. If she doesn’t drop it in my hand and goes to chew on it instead, I take it away and the training session ends. The next step is to start using other objects. I need to visit the dollar section of the pharmacy and get some cheap measuring cups, scrub brush, and other such things. We also need to move her touch from something I am holding to something I am pointing at. I’ve tried but she doesn’t get it. Could be an age thing. In teaching any thing through clicker training (aka positive reinforcement, aka force free training), the key concept is to break the trick, task, whatever down into small bits, teach those bits, then put them together. There are some foundation bits that are used a lot such as SIT and TOUCH. With TOUCH, I can link it to TAKE then to PULL. And soon we have Quinn taking a rope and pulling the laundry basket. Gail Hubbard from A Good Dog’s Life made a video with her dog, Tayt. She’s teaching him a trick. She breaks down the trick into small bits and slowly gets him to do the entire thing. I’ve put the video below but go read the post to learn what she is doing and why and how to do it yourself. In another video, Donna Hill of Service Dog Training Institute teaches a dog to touch then flip a light switch. Watching it is both boring and exciting at the same time. I will be adapting this to teach Quinn to push buttons. I don’t *need* her to do light switches but we may do it just for another notch on the cape belt. Donna Hill, who is legendary for her training, has a bunch of videos on stuff from agility to bird dogs to service dogs.